On February 27, 2013 America's first self-funded commercial space passenger, Mr. Dennis Tito, announced an audacious space plan to send two humans on a flyby mission to Mars in the Year 2018. The proposed effort is predicated on a known launch window in 2018 for a 501 day minimum energy ballistic trajectory. It is truly an innovative concept, and unlike many recently launched grandiose plans for human exploration of the Moon and beyond, it has Mr. Tito's considerable check book behind it. While as of yet the plan is incomplete, it is a baseline from which to build on, and most importantly it does, I think, what Mr. Tito intended, which is to change the conversation about exploring beyond Earth orbit. I am not interested in comparing the Inspiration Mars (IM) plan to NASA's plans but to focus on what could be done to improve that mission. When I first walked into NASA JSC in 2000 with my Space Act Agreement for a satellite to be assembled on the station the center Director Mr. Abbey had these instructions for his center. "Your job is not to tell this man why he cannot do what he wants to do. Your job is to figure out how to help him do it". Wise words, so lets focus on what can be done to make it work and work better. The Time of Flight (TOF) of these missions is based on two parameters, propulsion energy available and the stay time on Mars (if any). The Fast Free Return Mission (FFRM) with a TOF of 1.4 years (~501 days), is the lowest energy of any of the Mars missions [Landau] and Patel studied. 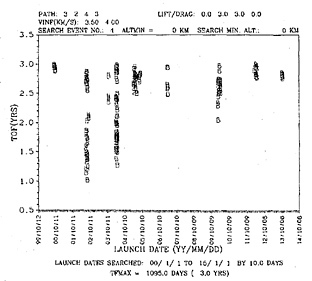 However, the classes of missions studied by Patel et al do not cover the entire realm of FFRM trajectories. The idea is to minimize the transit time, which conceptually the FFRM does. This minimizes the radiation load on the crew, reduces consumable requirements, and decreases the chances of a catastrophic failure. This has to be done within the context of what is achievable with a cost and energy limited system. According to the IEEE paper the team used an injection mass of 10,000 kg to get a DeltaV excess (the amount of energy above Earth escape) of 4.86 km/sec. The paper goes on to state that the Falcon Heavy can provide 9,800 kg to a trans-Mars injection (plus the expended upper stage) on the date outlined in the Patel et al. paper. This provides the necessary orbit shape to match Patel's parameters called the "Free Return Opposition" variation for an August 20, 2018 encounter of Mars. The return to Earth is set to May 21, 2019 at around 21 hours GMT. This provides a total trip time of 501.57 days. However, the incoming velocity is 14.18 km/sec, which is higher than any mission that has flown so far. Therefore, the paper broke the entry into two segments with a approximately 10 day Earth orbit after the initial aerocapture, breaking the ~14.2 km/sec incoming velocity into two ~7.1 km segments. This drives incredibly precise targeting of the atmospheric window for the mission as a miss no more than a few km in either direction would result in a bad day for the crew, fried or thrown back out into interplanetary space. The plan then goes on to talk about other aspects of the mission, focusing most of the rest of the paper on the Environmental Control and Life Support Systems (ECLSS). That part of the team has a good grasp on their requirements and what needs to be done, though the notion that consumables and spare parts for a 501 day mission can be stored in the Dragon is a non starter. The team understands this and their revised graphics show an inflatable module, though an inflatable module really does not solve the storage problem. The paper is basically an interesting mission analysis based on the Patel et. al. paper coupled with a good discussion of the ECLSS system. It shows a possibility of a mission based around existing systems, not requiring a behemoth launch vehicle or a large crew module like Orion. It is a Spartan mission with the vision of capturing the imagination of the public. Inspiration Mars is a concept that goes beyond what many of the newly public enterprises have and as it is done as a non profit, many of the psychological barriers (business plan credibility) that many of the recent for profit exploration companies have to overcome do not exist. The presentations and the press conference since the papers unveiling have basically confirmed the details and the team has indicated that they are looking at other launch vehicle combinations and possibly even other capsules so that they are not 100% locked into a SpaceX design. The mission takes advantage of a flight opportunity that only comes around rarely and so if they miss this date, the mission is off for over a decade. A deadline has a way of focusing the mind and sharpening the knife but at this time they are only fifty eight months away from launch, and that time passes exceedingly quickly. This paper is not an architecture and it is not really even a systems design as the unknowns are large, the assumptions are many, and many critical issues are not discussed. Based upon publically available knowledge about the SpaceX Dragon, it is pretty much a given that it cannot be the only habital volume, especially along with the humans, food, and spare parts that go in there. My own initial thought about carrying along an inflatable that could be pulled out of the trunk turns out to be a non starter as well as the thing that you need, volume at launch, is needed to carry all the extra goods. Thus, the 10,000 kg payload is out the door, and it is much more likely that the payload is up around 15,000-17,000 at an absolute minimum. This immediately drives you to a two launch architecture as the existing numbers from SpaceX on the throw weight to Trans Mars Orbit (TMO) are likely to be optimistic, which starts to drive other requirements. There are other issues but rather than dwell on them, lets see what can be done to improve things. In order to make a mission like this work (or any mission for that matter), clear, concise goals are a must. These goals must be obtainable within the resources of the effort, especially with a short timeframe based upon a celestial event of infrequent occurrence. During the Apollo years the goals of the program were quite simple, "get humans to the Moon and back and do it before the end of the decade". A similar approach here, and adherence to that helps to keep everything focused and keeps mission creep from driving up costs, burning schedule, resulting in failure. 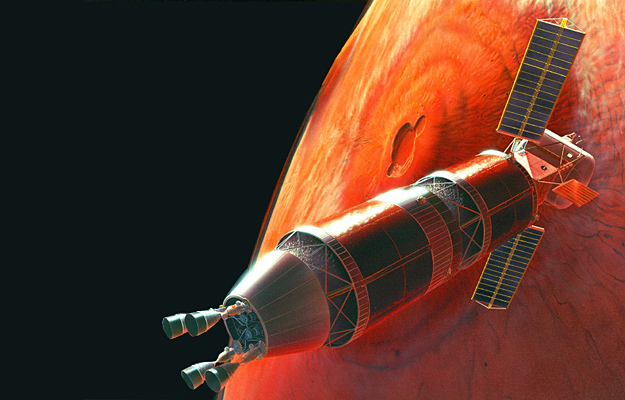 "Sending humans on a expedition to Mars will be a defining event for humanity as well as an inspiration to our youth"
The mission statement for Inspiration Mars is subordinate to the vision statement but the mission statement is also required so as to bound the problem to be solved. The vision statement is the strategic goal, the mission statement bounds the technical implementation. In a healthy development of a mission concept you start out with what NASA now calls level zero requirements. Which, in the Dennis Tito case, is quite simple and a mission statement would be ..
*	Send two humans on a mission to Mars and return them alive, as soon as is practical, at the least possible cost. Everything is subordinate to this simple sentence and there are vast implications and derived requirements that flow from the sentence. This level zero requirement is inherent in everything in the paper and drives all subordinate requirements. Tito is not petitioning NASA to do it, rather, he is offering to either pay for it or help pay for it and raise the rest of the money. This is not an open checkbook and the timeframe that is in the paper of 2018-2019 has been set, mostly due to the advent of a minimum energy trajectory developed in the Patel et. al. paper that will not repeat for another fifteen years. Thus we have the following fixed requirements. These three parameters bound the mission. If you did not care about getting them back alive the mission could proceed much sooner and at a lower cost. However, since all three parameters must be satisfied, these are the minimum requirements with which to do the mission. This is what implicitly drove the mission design to the January 5, 2018 launch as the 2018 trajectory from the Patel et. al. paper represents the least energetic total mission trajectory and thus (theoretically) launch vehicle cost. The 2015 launch date which is the other near term choice in the Patel et. al. paper was not considered practical or cost effective. The first three parameters are the most important. The chosen dates fell out of a detailed trajectory study done to improve the fidelity of the generalized parameters in the Patel et. al. paper. The exact dates are not that important as long as they are not so near in time as to violate the practicality requirement. In order to have an improvement, any of the first three parameters must be reduced, ideally all of them as long as requirement number 2 of minimum cost is not egregiously violated. All the rest of the downstream requirements are dependent variables of the three parameters in the bulleted list so the first thing to look at optimizing is the mission. In the engineering world it is always more efficient to see what others have done before you run off to redo the work. This scenario saves 26 days over the Patel scenario. It also has a lower outgoing delta V and a slightly lower return delta V. The problem is that it is almost ten months sooner than the 2018 window which may be problematic to keep the cost down. The incoming delta V is a bit lower than the Patel scenario and every little bit helps. The Venus flyby is a major benefit though as it would up the inspiration quotient considerably. Since the Patel scenario also has a Venus distance flyby the thermal considerations in design are the same. This one is well worth trading against the Patel scenario. Okutsu and Longuski delved into the very interesting subject of Aero-Gravity Assists (AGA). If the Inspiration Mars mission used an Earth-Mars-Venus-Earth with a ten day saving over a gravity assist, according to the paper, there are improvements with an Earth-Mars-Earth AGA flyby as well but this is not documented. Though the launch times are outside of what are of interest to the Inspiration Mars mission, serious consideration should be given to extending these studies out through 2019-2020 for the Inspiration mars mission. For example In the first part of the table several missions are possible with modest Lift over Drag profiles that give shorter flight times, lower launch delta V, and a lower arrival back at Earth delta V than the pure gravity assist versions. This mission is a bit longer than the Okutsu and Longuski mission but it has a much lower outbound delta V than any of the other missions and a bit lower incoming velocity than either mission. The Foster and Daniels mission deserves a much closer look as the large decrease in outbound delta V, (4.19 vs 4.86) could be huge in reducing launch vehicle cost. The plot on the left is the gain in km/sec at lunar perigee and on the right at apogee. The maximum gain is about 1.75 km/sec under ideal conditions. It is highly unlikely that ideal conditions will be present for the Inspiration Mars mission launch date of Jan 5 2018 or any of the alternate dates. However, there is still potential for a gain in excess of a km/sec under moderately favorable conditions. 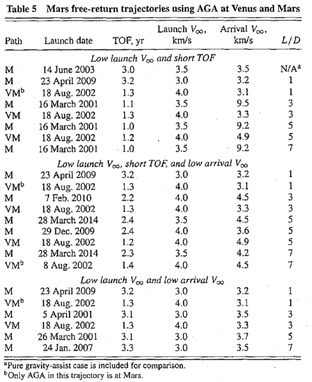 For example, for the baseline Patel trajectory the Moon is only a couple of days past full, meaning that if the launch dates were modified just a bit, a considerable gain in delta V is possible. In checking the ephemerides, the Moon is near apogee around the launch date so the graphs on the right more correctly correspond to the gain. It looks like for even moderately favorable conditions that a gain of about 1.1-1.3 km/sec is possible. This brings the delta V required by the launch vehicle down by 25%. This would bring a major benefit to the Inspiration Mars mission in reducing cost, lower time of flight, and or improving practicality. The BepiColumbo mission is also interesting in that it uses what I call a mixed mode of propulsion, combining ballistic trajectories, gravity assist flybys, and Solar Electric Propulsion (SEP). This combination has not been analyzed for Mars missions, especially human Mars missions but the gains could be considerable. In a brief back of the envelope calculation, if a SEP stage of modest performance (1 newton thrust, 2,500 Isp) were used, the TOF is further reduced, and mass delivered is improved by an additional 10-25%). Also, the incoming arrival velocity at the Earth is reduced, which eases thermal protection system requirements. The improvements in trajectories, orbit timing, and flybys have the promise to dramatically improve the possibility of success for the Inspiration Mars mission. Beyond that they bring further flyby opportunities for the Moon, Venus, and Mars all on the same flight! Thus it is strongly urged that the Inspiration Mars team continue to improve their trajectory work as the gains to be had contribute materially to the success of the mission. Other thoughts are is that it is clear that a single launch solution is not viable, even with a Falcon heavy. It is also clear that it is pretty much not possible to stuff all the spares, clothes, food, water, thermal protection, and other things that are required either in the Dragon or the inflatable that they showed in their press event in Washington. I thought about an inflatable as well but the problem with an inflatable is that you don't have the volume available until you are already up there and it inflates. Thus some type of hard module is going to be required. I want to go into this in a more thorough fashion in a following missive on this great mission. I congratulate Dennis on his vision and willingness to take this bold step. I look forward to seeing how Inspiration Mars unfolds.